SQL Server Reporting Services (Shortly called as SSRS) is a server-based reporting platform used to create and manage tabular, matrix, graphical, charts and free-form reports. The reports that we create can be accessed and managed over a World Wide connection. 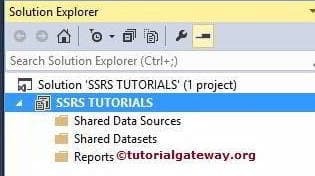 In this article, we will show you the step by step approach to create new project in SSRS with an example. TIP: SSRS can extract data from both the relational and multidimensional data sources to generate a report. Click Ok to finish creating New SQL Server Reporting Service project. Now if you look at the Solution Explorer, you can understand the solution name and project name. Shared Dataset: If you want to share the same dataset to multiple reports then we have to create shared Dataset. Please refer to Shared Dataset in SSRS article to understand the Dataset configurations.